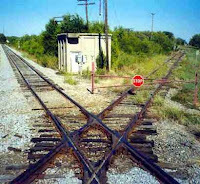 When railroads began to crisscross America, they were exciting phenomena. Trains were noisy and huge. As a train streamed by, a farmer standing in his field could look up and fantasize, for a moment, where that train might take him. Even the Amish, bound to a long tradition of non-mechanization, were not immune to the romance of the iron horse. 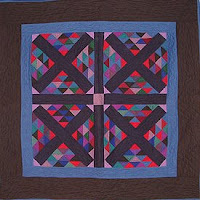 One quilt pattern occasionally seen in Midwest Amish quilts is called Railroad Crossing. The block basically echoes the diagonal cross of the classic railroad sign and then is complimented by lots of tiny triangles. The two block version here is thought to have been a hired man's quilt--a long and narrow quilt made to cover a cot or bunk of the hired laborer's bed. The Railroad Crossing pattern can also been made in multi-colored scraps as shown in this four-block crib quilt. Instead of stars in the center of the X's, as in the hired man's quilt, the dark X shapes remain while the backgrounds, pieced in a variety of jewel-like colors, become the exciting part of the quilt. The small lavender churn dash at the quilt's center just happens when pieced sashing and four tiny triangles meet. I love trains and also want to make a quilt in this pattern one day. Think I'll go for the multi-scrap look as a touch of ADD keeps me from working in a limited palette.